Newly introduced Tariff of A2 in 2015. 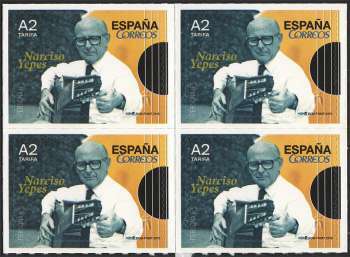 The figure of classical guitarist, soloist and composer Narciso Yepes is featured on this sticker stamp, which shows a snapshot of him playing a ten-string guitar. Narciso García Yepes (Lorca, 1927-Murcia, 1997), born into a peasant family, started taking solfège and guitar lessons from a very early age. His family moved to Valencia during the Civil War, where he enrolled at the Higher Music Conservatory at the age of 13. There, he met other musicians and guitarists, his true maestro being the composer Vicente Asencio who made him rethink all his guitar playing techniques. In 1944 he successfully completed his music degree, receiving special recognition in all subjects. Orchestra conductor Ataúlfo Argenta discovered his talent after hearing him perform and encouraged him to move to Madrid. In 1947, Narciso Yepes made a great leap forward in his professional career when he performed the “Aranjuez Concert”, from maestro Joaquín Rodrigo, conducted by Ataúlfo Argenta. From that point onwards, he started touring cities around the world. He moved to Paris for several years and took lessons from the Romanian maestro George Enescu, who also taught other renowned musicians. He composed the work “Jeux interdits” (1952) in the city of Sena, which was used as the soundtrack of the René Clément-directed film of the same name (known in English as "Forbidden Games"), awarded at the Cannes Festival. Yepes was a lifelong learner and his search for possible new guitar techniques led him to discover new instruments. After some time at this, the maestro concluded that the traditional guitar should have four more strings so as to play a full range of notes. He then designed a guitar with ten strings which he played for the first time in Berlin in 1965. From that year on, he performed all his concerts with this same type of guitar. Narciso Yepes was honoured throughout his life with several distinctions and prizes, the most notable of which include: the Commander's Cross from the Order of Isabel the Catholic; the National Music Prize; Honorary Membership in the Giuventú Musicale D’Italia; a Gold Medal for Fine Arts and Academic from the Alfonso X el Sabio Academy.